It was time to reevaluate my lifting program. When I first started lifting, my program was relatively easy. I was using the Starting Strength novice routine. That included doing 3 sets of 5 reps for the four main lifts. Once that was accomplished, I would add 5 or 10 pounds to the bar the next session. If I stalled, all I had to do was decrease the load by 10% and start over from there. Easy peasy. But at some point, novice linear progression stops and you become an intermediate lifter. Programming for an intermediate lifter becomes much more difficult and complex. The weights are heavier, and that means more stress. Also, your expected gains are now a lot smaller. When you’re an untrained novice, your strength gains can be quite impressive. You get stronger very quickly. But when you’re an intermediate lifter, you struggle for months sometimes just to increase your 1 RM (one-repetition maximum). For master (45 years old and up) intermediate lifters, programming can be even more difficult. As I said, heavier weight means more stress on your body. More stress means that proper recovery is vital. If we don’t recover well, we can regress or get hurt. And if we do get hurt, the chances are that we may not heal as quickly as we once did. The facts of life are that we are not going to recover like a 25-year-old. So a constant awareness of programming for our age group is important. Since my goal is to get stronger and avoid injury, I had to discover if I was doing something wrong. However, before I made any drastic changes to my program, I had to first deal with my back injury. About a year and a half ago, I stalled on bench press and decided to switch to the Wendler 5/3/1 program. A short time later, I decided to use 5/3/1 for all my lifts. On the 5/3/1 program, I raised my deadlift base weight 5# every month. I also deloaded every fourth week. When I got injured, my deadlift base weight was 315#. A couple of weeks ago, I had trouble deadlifting 277.5# 1 x 3. I did get 2 reps, but the weight fell out of my hand on the third rep. Grip strength is a common problem that retards deadlift progress so I figured this was the problem. I came back the following week and completed all my lifts without a problem. I hit a new 1 RM of 292.5# pretty easily. However, my problem with 277.5#, 1 x 3, should have been a clue. The weights were beginning to feel heavy. They should feel heavy. After all, it’s 277.5 pounds. But the previous sets also felt heavy. Also, during the week I hurt my back. That meant I was feeling generally fatigued. It should’ve been another clue. Even though I just finished a deload week, I didn’t feel 100% recovered. Before I hurt my back at 232.5#, the previous set (including warm-ups) felt heavy. The 232.5# lift should have been a piece of cake. The first four reps felt heavy and the bar was pinching my left hand. I put the bar down, reset myself, and started the lift. Then it happened. Pain shot through my lower left back. The pain didn’t double me over, but I knew there was no way I was going to attempt my last set. As I sat and rested, my lower back tightened up and the pain localized to my lower back around the left sacroiliac joint. As the day went on, it became harder and harder for me to get in and out of a chair. I basically became immobile for the rest of the day. Trying to sleep that night was terrible. Whenever I turned, I experienced a sharp jolt of pain in my back. My Fear: A Torn Erector Spinae Muscle? Initially, the pain was much worse than the occasional spasms I had been getting for the past two months. I was afraid that I had torn a muscle. If I had torn a muscle, it was probably the left erector spinae. The erector spinae are a bundle of muscles that run from your lower back and attach to various places on your spine up to your skull. They are responsible for controlling forward bending and extending your back from a forward position. Now, knowing how bad my injury was, I decided to follow the Starr Method for muscle belly repair. This calls for the immediate application of ice to the affected area for the first 24-36 hours following your injury. Icing will calm down some of the initial effects of inflammation. Caution: Ice should never be applied directly to the skin and should be used for 20 minutes on and 20 minutes off for as often as you can throughout the day. Starr then recommended that the injured area be worked as soon as possible. That’s about 4 days post-injury. He suggested that you begin by seeing if you can work the area of injury with the same exercise that caused the injury without increasing pain. If so, then you should work the area daily with light weight, using many reps and good form. See here. 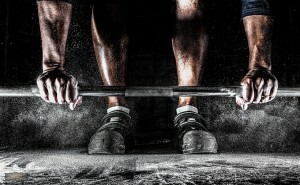 Every day more weight is added to the bar until the effects of the injury are gone. No other heavy lifting should be done until the injury is healed. Ice therapy is used after every lifting session as well as each morning and night. Starr claimed this rehab protocol decreased scar tissue and got you quickly back in the gym. For a more in-depth explanation of the Starr Rehab Protocol, see here. I injured my back on the Saturday of Labor Day weekend. By the end of Sunday, it was about 50% better, and, by Monday, it was 70% better. Because Monday was Labor Day, I got to rest for another day. On Tuesday, it was 90% better, and I was able to do bench press without any problem. During squats on Wednesday, I felt some tenderness but not a lot. Since I was able to quickly return to lifting, I assumed I didn’t have a muscle tear. It was probably just another back spasm. I believe these spasms are secondary to a disc or nerve problem that I’ve had all my life. However, I might be aggravating the situation because of the increased intensity of weight during deadlifting and perhaps because of poor form. I’ve been working on my disc problem rather diligently, and I’ll write about that in the coming weeks. A week after my injury, I decided to use the Starr Rehab Protocol. I started with 65# at 10 reps and completed that with absolutely no pain at all. I did have some tightness, but that was it. So I decided to increase the weight 75# for 10 reps. Again no problems. For the rest of the session, I decided to work on form. My son Pete r told me that when I was lifting heavy weight, I was slightly arching my back. I eventually worked up to 190# 1 x 5 with no problem. You can see what I did below. It was obvious that I didn’t tear a muscle as I had zero pain while lifting and no tightness or pain afterward. So that was good. Now the question was how to go forward. Going forward there were several problems I’d have to fix if I was to continue getting stronger on deadlifts. The first was reducing or eliminating back spasms. Lately, I’d been getting too many, and now they were interfering with my lifting. Why did a set feel heavy when previous identical sets were easy? Why did I get injured on a weight that should have been easy? To answer these questions, I had to evaluate my programming. Was it possible that I was just lifting too much weight and too often to a point where it was taking a toll on my body? In other words, was I over-training? Was my form breaking down with heavy weight? Or was there a defect in my recovery? Did I need more rest? These are questions all master intermediate lifters are going to have to answer at some point. Our goal is to get stronger and healthier. We can’t do that if we’re injured. That’s all for this week. Next week, I’ll explain how I’m going forward. Please remember that any information in this post is not given as medical advice.